For the first time in the history of the Really Awful Movies Podcast we’re tackling an animated feature. On today’s episode, Heavy Metal, an anthology fantasy film that featured a bunch of scantily clad heroines and a bitchin’ soundtrack showcasing the likes of Sabbath, Sammy Hagar and Nazareth. 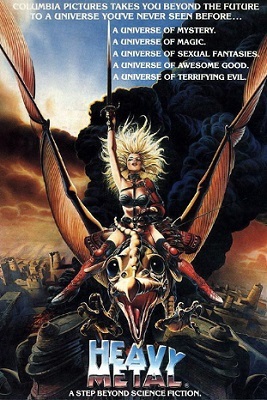 Heavy Metal is a 1981 Canadian-American co-production. The film was directed by Gerald Potterton, produced by Ivan Reitman (Ghostbusters) as well as Leonard Mogel, who was also the publisher of Heavy Metal, a magazine whose French edition inspired this film. Heavy Metal’s poster says it is a “universe of mystery,” but what kept it grounded was the the slew of familiar characters voiced by noted Canadian names like John Candy, Joe Flaherty, Eugene Levy, Harold Ramis, and John Vernon (re: the latter. In an early episode of the podcast we covered Curtains, as well as another the fun pic, Killer Klowns from Outer Space). Despite being a cartoon, this definitely falls under the category of “not suitable for children” (Snarky Editor’s note: kinda like Woody Allen’s Upper East Side apartment?). Inspired by R. Crumb and his ilk from the 70s, this animated feature has all the kinds of stuff that makes being a teen boy all kinds of fun. This is a superhero tale essentially. And that means it’s basically good versus evil. And what connects the different vignettes together is a giant green globule (wait, that sounds like what was left on the drummer’s stool in This is Spinal Tap!). This orb thing-y has a bunch of magical powers. And as a result, it’s coveted by everyone. If that story line sounds familiar, it’s the plot of about 50 post-apocalyptic films shot in Turkey. Give or take. Made for 9 million and grossing 20, Heavy Metal was a modest hit…and it’s since become something of a cult classic (yes, that phrase is overused but here it seems to really fit). So, come join us on this episode of the Really Awful Movies Podcast. And check out new episodes of the show every Friday. THANKS!